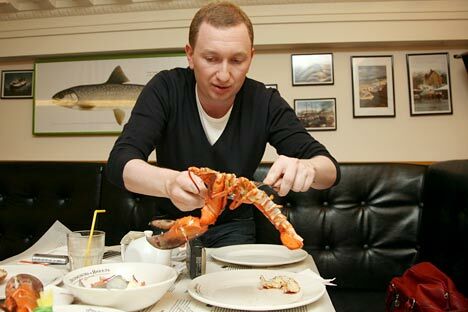 Mikhail Zelman opened the first Goodman restaurant in London in 2008. Source: ITAR-TASS. Mikhail Zelman, co-owner of Food Service Capital, is preparing to open his sixth London restaurant this fall. The entrepreneur talked to Kommersant about what attracts him to the British capital, how his holding company acquired the master franchise for the American fast food chain Wendy’s, and who helped him win the contract to supply on-board catering on Russian Railways’ express, intercity routes. Khalil Aminov: How did you get involved in the restaurant business? Mikhail Zelman: I was homeschooled and went to university rather late – I was 31 when I got my law degree. During the 1990s, I worked as a broker in the markets, and that’s where I got my first capital together. I used part of this money to open my first Moscow restaurant – Tamerlan – in 1997, where I was a minority partner. It was one of the first trendy restaurants in Moscow, frequented by businessmen and politicians. In 2003, I opened and ran a management company named Arpikom; and then, in 2010, I became co-owner of Food Service Capital. K.A. : Russian restaurateurs have been actively probing the market in UK’s capital. You are opening your sixth restaurant in London. Can you tell us why? M.Z. : I opened the first Goodman restaurant in London in 2008. I had my reasons for doing so. I wanted to put into practice a proposal that I had written. In the proposal, I argue that the future lies in single-item restaurants, which only serve one kind of dish. I’m certain this kind of restaurant can be successful. Take our Burger & Lobster restaurant in London, for example. It is thanks to this restaurant that Londoners can have a delicacy like lobster on a daily basis. It’s a very prudent business model. Single-item restaurants allow budgetary savings at every stage of the process – from buying the equipment to electricity bills. Running things this way enables us to recoup the investment involved much sooner than a restaurant run in the traditional way with an extensive menu. K.A. : Do you think that the development of single-item restaurants can transform the latter from food-art, as customers see it, into craftsmanship? M.Z. : Well, I think of myself as a craftsman. I firmly believe that single-item restaurants can find their competitive advantage. All you have to do is find the right product. K.A. : What is your opinion on Moscow's inability to become a trend-setter, at least within Europe, in single-item restaurants? M.Z. : Strictly speaking, Moscow was actually the birthplace of single-item restaurants. But for this concept to become global, it needs to take hold in other markets. In that regard, London, as a liberal-minded city, is ideally tailored for such experiments. It will take Moscow decades to reach this level, and I don’t have the time to wait. I can’t say with complete certainty, but I think people have chosen London because it’s a city where new restaurant concepts go over well. K.A. : This is hard to agree with, especially after The Guardian was particularly harsh in its criticism of Arkady Novikov’s first – and, so far, only – restaurant in London. M.Z. : Tare always some teething problems when restaurants first open, and it’s the critic’s job to highlight these problems. I’ve eaten in Novikov’s restaurant, and I liked it. K.A. : What attracted you to Switzerland, where you have also opened a restaurant? M.Z. : If London is Europe’s financial capital, then Switzerland is a country where wealthy individuals from around the world don’t just bank their money, but spend a great deal of time too. That’s why Switzerland has turned into such a cosmopolitan place. And this is reflected in the local restaurant scene. K.A. : Andrei Dellos – owner of Cafe Pushkin and the Mu-Mu chain – also shared his feelings with Kommersant about opening a restaurant in London, where it can take ages to get the necessary permits. In your experience, where is it easier to open a restaurant – In Russia or in Britain? M.Z. : There's no point in trying to compare these markets. The Russian restaurant business has only been going 20 years, whereas, in Britain, they’ve been doing this stuff for centuries. If something is permitted by law in Britain, then you can do it. But I would agree that bureaucracy in Britain is heavily regulated. It took me two years to open my first restaurant there. K.A. : You spend more time in London than you do in Moscow these days. Are you afraid of a losing control over your Russian business, leaving it in the hands of your top management? M.Z. : Obviously, I needed to be around during the initial stages of the business. But I set myself the goal of arranging the company’s structure in such a way that I could hand it over to management to run it afterwards. I’m on the board of directors of all the companies in the Food Service Capital holding group. The management of United Catering Group (which provides the catering on board the Siemens TGV Sapsan intercity trains) suggested that we harness the huge potential of the company in St. Petersburg, to provide catering on board airlines servicing Pulkovo Airport in St. Petersburg. Now we serve TransAero, S7, Emirates Airlines, Uzbekistan Airways and several others. United Catering Group will be providing catering services for British Airways starting next year. K.A. : How did you manage to obtain the master franchise in Russia to develop the Wendy’s chain? M.Z. : My friend Aleksandr Kovaler is a friend of one of Wendy’s shareholders. In 2010, he suggested that I evaluate a development strategy for the chain in Russia, since, at that moment, the American chain was looking for Russian partners. We put the project forward. After that, we created VenRus Restaurant Group, which manages the project. K.A. : The figures suggest that you have yet to start making a profit on the business. The annual accounts for VenRus Restaurant Group show an operating loss of $3 million dollars, on revenue of $2 million. M.Z. : The project is still in its start-up phase and, of course, losses are inevitable. What I can say, though, is that we hit the targets that we had set for this year. According to the business plan, we expect to show an operating loss for the first five years. The plan to open 180 fast food restaurants in ten years is running on schedule, and we’ll achieve it.1 Our confidence is based on the growth of the fast food market in Russia: this market’s share is expanding by 20–30 percent every year. We’re finalizing the details of a sub-franchising deal, so that we can begin selling it. This is the way we’re most likely going to penetrate the regional markets. K.A. : What is it going to cost to set up the entire network? And how do you plan on raising the necessary funds? M.Z. : The start-up investment for one outlet is between $400,000 and $2.5 million, depending on the location (high end, shopping mall food-court or street retail). The project will be financed by VenRus partners with loan capital. In addition to that, we’re currently looking for a portfolio investor. The full version of the article was first published in Russian in Kommersant.